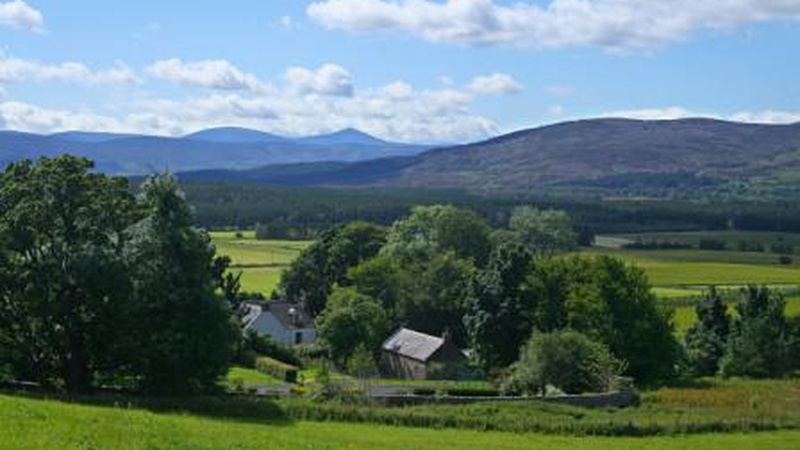 A former Manse situated in a beautiful location in the Aberdeenshire village of Logie Coldstone has gone on sale through our Elgin office. 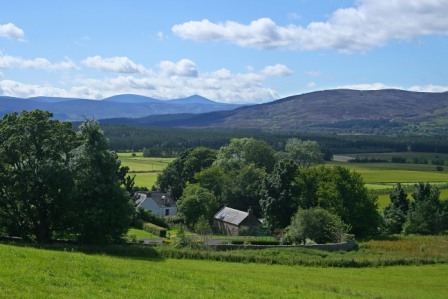 Coldstone House is an elegant category B listed property and sits in an elevated position enjoying spectacular panoramic views towards the summit of Morven and Mount Keen to the south. The house was built in 1783, with the porch and further extensions added in 1826. Constructed from stone under a series of pitched slate roofs, the house provides comfortable and very well proportioned accommodation over two and a half storeys. Coldstone is approached via a gravelled driveway, with a parking area at the front of the property. The entrance to the house is via a porch which leads into a spacious hallway with a fine staircase to the first and second floors. Doors also lead to a drawing room, with an attractive fireplace with a wood burning stove, and a dining room. From the hall a passage leads to the rear of the house, which is the location of the large family kitchen, a homely space complete with many integrated appliances including a four oven Aga. This area of Coldstone is also home to a wine cellar, a cloak room, a large larder and a utility room with two large Belfast sinks and a boot room leading to the back door. Upstairs, the first floor is split level, with the bright landing giving access to three lovely double bedrooms, a single bedroom, two en suite bathrooms and a linen cupboard. On the second floor, there are a further three bedrooms, two bathrooms and useful box rooms. The quality of the interior is matched by the property grounds outside, which extend to around 27.6 acres in total. 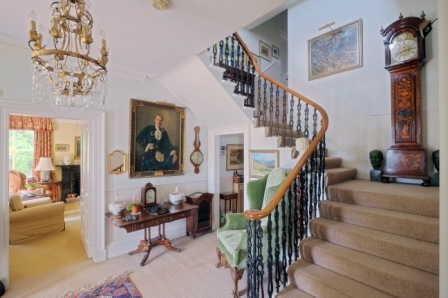 To the rear of the house is a fine, traditional E shaped steading comprising a number of separate stores and byres - the most impressive of which has been converted for use as a gallery with a mezzanine level artist's studio. The buildings provide useful storage space and, subject to obtaining the correct planning consent, may offer considerable scope for development into additional accommodation. Beautiful, mature gardens make up much of the immediate surround of the house, with a walled garden of particular delight. The grounds are predominantly laid to lawn and include a hard tennis court, various borders, a number of fine specimen trees and a summer house. 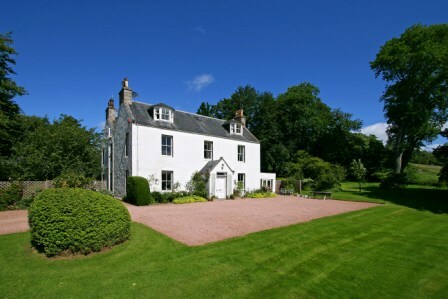 Excluding the house, steading and gardens, the policies include delightful mature mixed species woodland at Kirk Hill extending to about five acres and about 16 acres of good quality grazing land, ideal for those with equestrian or livestock interests. Rod Christie, who is handling the sale on behalf of CKD Galbraith, said: "Coldstone is an outstanding country house in a wonderful setting. The category B listing gives an indication of the wonderful character of the property and the extensive array of attractive features including open fireplaces, ornate cornicing, working timber shutters, an oil fired Aga in the kitchen and large windows throughout that flood the house with natural light. "The property is fairly unique in the area and is a wonderful size for use as a family home. The extensive grounds and gardens make it perfect for buyers who relish their own privacy and outside space and we would expect Coldstone House to generate considerable interest." Coldstone House is available at a guide price of 780,000. Find out more about Coldstone House or call our Elgin office on 01343 546362 to arrange a viewing.